Lost in time for generations, the story of a 19th-century English gentleman in British India-a family mystery of love found and loyalties abandoned, finally brought to light. In 1841, twenty-year-old Nigel Halleck set out for Calcutta as a clerk in the East India Company. He went on to serve in the colonial administration for eight years before abruptly leaving the company under a cloud and disappearing in the mountain kingdom of Nepal, never to be heard from again. While most traces of his life were destroyed in the bombing of his hometown during World War II, Nigel was never quite forgotten-the myth of the man who headed East would reverberate through generations of his family. 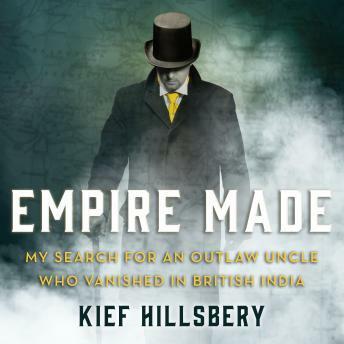 Kief Hillsbery, Nigel's nephew many times removed, embarked on his own expedition, spending decades researching and traveling through India, Pakistan, Afghanistan, and Nepal in the footsteps of his long-lost relation. In uncovering the remarkable story of Nigel's life, Hillsbery beautifully renders a moment in time when the arms of the British Empire extended around the world. Both a powerful history and a personal journey, Empire Made weaves together a clash of civilizations, the quest to discover one's own identity, and the moving tale of one man against an empire.